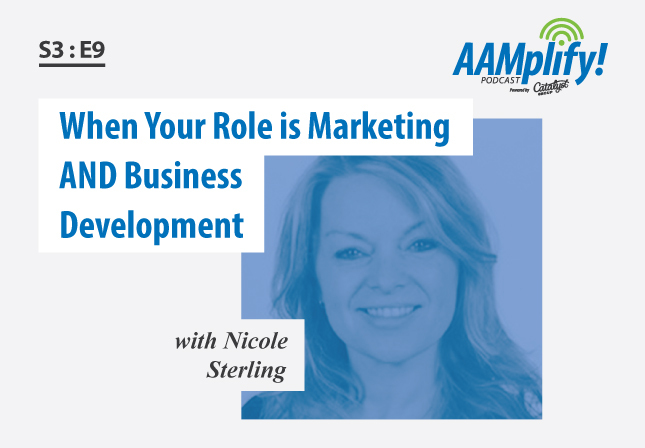 Marketing and business development activities work hand-in-hand and in this episode, I had the privilege of speaking with Nicole Sterling, Director of Marketing and Communications at RSW Accounting + Consulting in Montréal (Québec) on the topic. Sterling was 2017’s AAM Volunteer of the Year and is a current AAM Board Member. With over 17 years of marketing and business development experience, she has a wealth of information and experience in both disciplines. She was kind enough to sit down and share her thoughts and experiences with me during the AAMplify! podcast for October 2018. Click here to view the podcast “When Your Role is Marketing AND Business Development”. We started our conversation by talking about how the roles of marketing and business development overlap. Sterling noted that ultimately the two roles are created to meet the same end goal, but do so in different ways. Business development seeks to create partnerships and build relationships while marketing is about defining and delivering a message to a target audience. Aligning business development and marketing is an important strategy and works to benefits everyone. During our conversation, Sterling talked about some of the challenges she faces in her dual role, including determining ROI and securing an adequate budget. Whether it is on specific projects or products/services that aid in either business development or marketing, coming up with an exact ROI can be difficult and not always a tangible number. Additionally, MarTech (Marketing Technology) can be a little challenging because new technologies are coming out at an ever-faster pace. Today’s marketers need to have a certain level of technology savvy to be able to effectively setup and integrate these technologies correctly. Sterling also offered some advice to marketers or business developers transitioning into a dual role: Build relationships! Building relationships is important because it creates a foundation of trust and developing trust will lead to more of an advisory role with potential clients. Also, combining marketing and business development roles allows for the opportunity to create more cohesive strategies and improves the potential for developing and filling the sales funnel, thus converting more leads into sales. If you haven’t watched or listened to this episode of the AAMplify! podcast, be sure to listen to the full episode for more insight, advise and anecdotal examples from Nicole Sterling. 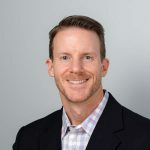 Scott Dine is Partner + Technical Director at Catalyst Group Marketing, a marketing agency for professional service firms. Scott has been a small-medium business advocate for over 20 years and has worked in a variety of roles as an entrepreneur, business developer, project manager and website developer. Additionally, Scott is actively involved in AAM as Chair of the AAMplify! Podcast Committee and as a member of the Website Committee.